It's located in Pasadena, California, built in 1946 for the architect's brother and lived in by Neff himself until his death in 1982. John Kelly explored the mid-20th century history of Neff's then-revolutionary houses, created to shelter people during the World War II housing crunch, in a March 11, 2007 Washington Post column, which follows. Q. The renowned California architect Wallace Neff built his first "bubble" house during World War II somewhere in Falls Church. Where was it located? A. The bubble house. The shell house. The igloo. These were all nicknames for a type of distinctive, experimental dwelling Wallace Neff designed to shelter people during the World War II housing crunch. Another nickname reveals the clever way the homes were built: the balloon house. Picture, if you will, a giant, flaccid balloon made of Goodyear rubber. It is lashed down to a concrete pad and then inflated. Once it has achieved its hemispheric shape, concrete is sprayed over it. Some insulation is laid down, followed by another layer of concrete. When the concrete has hardened, the balloon is deflated, removed and used again. Neff called them "airform" houses. They were cheap and easy to build quickly, and the walls were said to be impermeable to shrapnel. 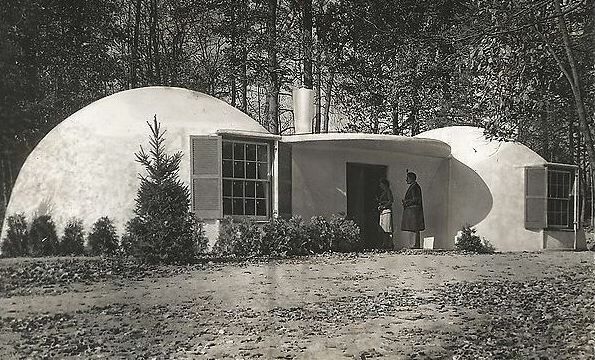 In 1941, a dozen airform houses were built in Falls Church, of two different designs: single, huge domes and smaller double domes joined by a hallway. "We called the double houses bra houses, because they looked like a bra," said Carolyn Fix, 84, who lived nearby. The houses were on Horseshoe Hill, near what is now Lee Highway and West Street. As late as 1960 you could rent one for $40 to $70 a month. They were demolished in 1960 to make way for the Timberlane Park Apartments, which are now condos at 7316 and 7318 Lee Hwy. Only one airform house remains in the United States. It's a single-dome model, built in Pasadena, Calif., for the architect's brother. Neff himself lived in it before his death in 1982. Steve Roden and his wife live in it now. "It is actually totally wonderful," Steve, an artist, told Answer Man. Only 1,000 square feet, the two-bedroom house has a ceiling that's 12 feet high at its tallest point. There's hardly any closet space — "a dilemma," Steve admits — and he sometimes hits his head on the curved wall when he gets out of bed. The walls don't go all the way to the ceiling, being more like concrete partitions. Despite all that, Steve loves the house, which he likens to an inside-out swimming pool. "It just has a very warm kind of open, comfortable feeling," he said. "It's not claustrophobic at all." Falls Church residents complained of damp, but that isn't a problem in Pasadena, or in West Africa and Pakistan, where Neff's principles are still employed. Steve appreciates the utopian ideals Neff was trying to advance with his airform houses: "I just think it's amazing that someone who existed in a public realm doing something gargantuan had a dream of doing something humble and simple for people." Note that the house pictured above (and yesterday at this time in a "What is it?" feature) is one of Neff's double-dome versions; the surviving example in Pasadena is one of his single huge dome iterations.